Salmuera (brine) is a fantastic, yet overly simple, concoction to use as a basting sauce (previously mentioned in the simple adobos post). I’ve said before that salt is largely the only seasoning used on barbecued meats in Argentina. Salmuera stays in line with that tradition yet also includes the added benefit of keeping meats that require lengthy cooking times from drying out. If you want to go one step further, you can introduce a little extra zing by adding one or two of your favorite herbs, spices, fruit peels/zest, or even chile peppers. 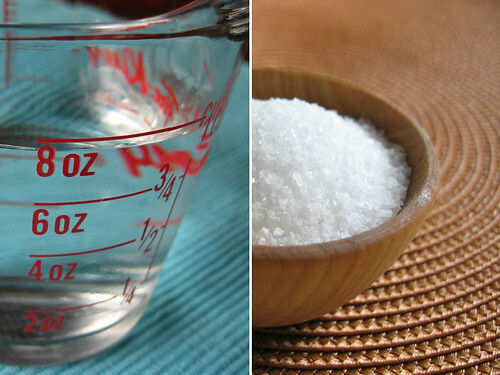 Do you salt the meat beforehand if you are going to use salmuera? Some people do but I usually don’t-depends on the meat. You can always add salt later. Once again, this is one of those things that is best left up to you and what works out best. A friend introduced me to this delicious salmuera con ajo (garlic brine) some time ago and I must say that it has become quite a favorite to use on asado de tira (cross cut strips of ribs). The salt breaks down the piquancy punch that garlic likes to throw at our tongues. The end result is a subtle salty garlic touch that mildly accompanies the flavor of the meat instead of overpowering it. Let it sit for an hour at room temperature before use. Brush or spoon over the meat a few times on each side while cooking. I prefer using a spoon in order to get a good distribution of those garlic chunks and brine. If you want to bring out the flavor or essence of ingredients (a must for dried herbs and fruit peels/zest), heat the salmuera in a sauce pan up to a point when it is just about to boil. Then remove from the burner, add the ingredients, and allow to cool.